Thanks to Sarah Jamieson for the ticket. 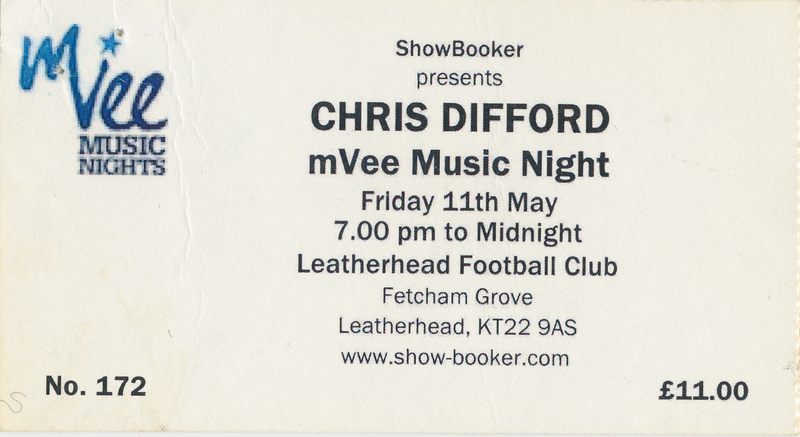 5 Responses to "Chris Difford – 11 May 2012 – live at Leatherhead FC"
If only I didn’t have a gig myself tonight! Had a great time last night (only just recovered! ), the combination of Norman (who was hilarious in a very surreal way) and Chris worked extremely well. Good choice of songs, obviously the old faves, but the solo stuff was good too. Dorrie was fantastic and complemented Chris so well. The atmosphere was nice a relaxed, and how shall I say, intimate. It was like having Chris play in your front room Brilliant stuff. And to cap it all, I got Chris to sign my Squeeze ticket from the first time I saw them at Portsmouth Guildhall on 18th May 1981. It only took 31 years!! I had seen Chris solo before a few years ago in Newbury when he played in front of about 20 people, that was great but last night just shows that like a good wine, he is getting better with age. Cheers Chris! Hey Tanner. Glad you enjoyed it. What was his set-list if you remember? Sorry can’t recall if that’s it! !